The comprehensive research report titled “Endodontics Market: Global Industry Analysis (2012–2016) and Forecast (2017–2022)” by Persistence Market Research supports the reader by assisting him in slating all possible strategies based on valuable insights in order to maintain the much needed tempo with the changing dynamics of the market in the present scenario as well as few years down the line. Endodontics deals with the dental pulp biology and involves etiology, diagnosis and treatment of diseases and injuries related to dental pulp. Endodontics field has been researched upon extensively and several advancements and developments have been carried out to enhance the effectiveness of the treatment. Endodontists, surgeons performing endodontics, carry out surgery, root-canal therapy, endodontic retreatment, treatment of cracked teeth as well as treatment of dental trauma. Endodontic therapies protect the tooth from diseases and infections caused to the dental pulp containing arteriolesm, nerves, lymphatic tissue, fibrous tissue and venules. Persistence Market Research has come up with an extensive and insightful research report on endodontics market by studying numerous elements of the market that influence the growth of the global endodontics market. These elements include trends, developments, economic aspects, innovations, restraints and drivers that impact the global market growth. The impact analysis covering these factors delivers value with which new strategies can be devised with a view to overcome hurdles in the market and look forward to future expansions. The research report also covers future market scenario with projections of five years down the line, from 2017-2022. 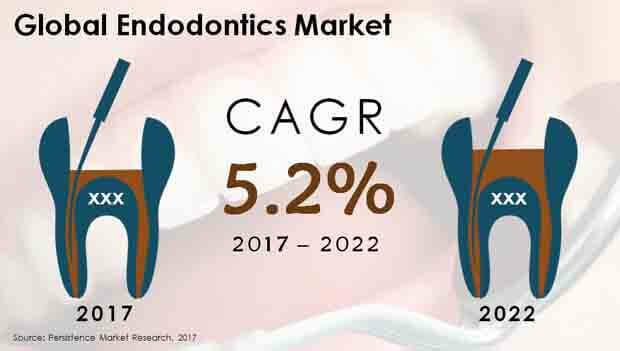 According to Persistence Market Research, the global market for endodontics is predicted to grow at a steady CAGR throughout the forecast period and is estimated to reflect a market valuation of around US$ 1.6 Bn by 2022 end. Europe region is predicted to show high market attractiveness and presents high opportunities to players involved in endodontics. This region is predicted to stay at the first position with respect to market share. The Europe endodontic market is projected to grow at a high 6.0% CAGR during the period of forecast. Asia Pacific excluding Japan (APEJ) region is also expected to show high potential from a growth perspective. This region is currently witnessing significant growth in the endodontics market owing to large number of players investing in this region. By the end of 2022, the valuation of Asia Pacific excluding Japan (APEJ) region in the endodontics market is estimated to grow above US$ 370 Mn. The consumables segment by product type is predicted to expand at the highest rate during the period of forecast. This segment is estimated to be the largest segment as of 2017 and is anticipated to retain its status quo till the end of the forecast period. By the end of 2022, this segment is estimated to reach a valuation of about US$ 1 Bn. Moreover, this segment is, likely to gain the highest BPS by the end of the forecast period. The global market for endodontics research report focuses on various key companies in the endodontics sector. The research study unveils various facts of these key companies such as SWOT analysis, company overview, key developments, product innovations and portfolio, and other key financials. To name a few key players, companies like Dentsply Sirona Inc., Danaher Corporation, Ivoclar Vivadent AG, Ultradent Products Inc., Septodont Ltd., FKG Dentaire S.A., Peter Brasseler Holdings, L.P., Mani, Inc., and Coltene Holding AG are profiled in this extensive research report.